Is LottoBonus a Scam or Legit? Read 2 Reviews! 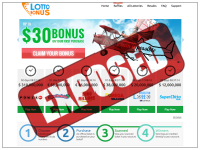 LottoBonus Exposed — How Much Is a Bonus? Does this look familiar? LottoBonus.com caught our eye not for its originality, but because it looked so much like some other lottery sites we’d checked out. It basically is a clone of LottoSend and GulfLotto though they say there is no relationship. This online lottery provider offers single ticket lottery games plus syndicates. Is there anything different here? Each of the lotteries has a minimum purchase ranging from 3 lines for EuroMillions to 10 lines for Australia’s Powerball. Games available for players at LottoBonus.com include US Powerball, Mega Millions & California’s SuperLotto Plus, EuroMillions & EuroJackpot, Italy’s SuperEnalotto, Spain’s El Gordo and Australia’s Powerball, Oz Lotto, Saturday, Monday & Wednesday Lotto. Syndicates are available at Lotto Bonus each of the lotteries offered. Players can buy into 50 ticket lines shared between 200. Lottery numbers are “pre-selected mechanically”. There are discounts for multiple draws, though this isn’t spelt out or advertised. Click on multiple draws (up to 120) and then do the calculation – yes the longer you play, the bigger the discount. So what else? It looks like LottoBonus.com offer different raffles as they become available. “Raffle San Valentin” was just added to their site. This looks like a raffle in the style of El Gordo Navidad with shares divided into decimos (ten parts per share) though don’t look to this site for actual information. There is none excluding a countdown clock to when purchasing your ticket (we think) closes. It also looks like there is a cool €105 million being given away – though no info on the prize tier. Lotto Bonus separates the rules and regulations on getting your winnings. For “Jackpots and Locally Taxed Winnings”, winners have to collect the money. Okay, they also say they might offer to collect the prize for you. “Secondary Winnings” are collected by Lottobonus and put into your account. Interestingly, they mention bank fees that could be deducted when they send you your money but no other costs plus no minimum amount you need in your account. LottoBonus.com also says that it will take 5 to 7 business days to process your request and then up to another 5 days for you to receive it. First time players, get a one time offer of a 100% welcome bonus. But hang on. Spend more than $30 and that welcome bonus is limited to $30. This is credited once you pay for those first tickets. Don’t forget you can’t withdraw this amount but need to spend it on more ticket lines. Don’t look for live chat here. There are telephone numbers for the UK, US and Spain available 9: 00 am to 6:00 pm (GMT+2) Monday to Friday. There is an online form which Lotto Bonus says they’ll answer within six working hours. Buried deep in their terms and conditions is an email address. Lottobonus.com is owned by Sapphire Premier Services Ltd. with a snail mail address in Cyprus. Going back into different sites, they all seem to have jumped on the bandwagon of the Spanish Valentine’s Day lottery. At least TheLotter.com gives the total prize breakdown. Don’t forget there are taxes applicable for winnings over € 2,500 in Spain of 20%. This site gets a thumbs down if for no other reason than the ratio of shares versus ticket lines in their syndicates. Plus, why say 100% welcome bonus and limit it to $30. I think that lottobonus are great! I had great experience with them. I won 18k USD and got the money after 3 business days. I don’t like an online provider that has a minimum purchase of tickets. If I want to try playing a new lottery, I like to do it with one ticket. I also like syndicates and forget this site’s groups. I look for a site that gives me more tickets than people playing in it.